For more than 15 years the Liniar fencing range has been providing an attractive, low maintenance alternative to more traditional fencing products – and the latest enhancement has made them an even more alluring option. The new range of woodgrain effect posts and gravel boards delivers the natural appearance of timber while being completely maintenance free and guaranteed for a minimum of 10 years. 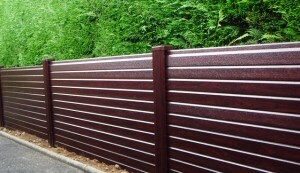 Liniar’s woodgrain effect fencing is beautifully foiled and available across the full range of gravel boards, post caps and utility strips and is available in Golden Oak, Rosewood, Black and Anthracite Grey. Made from lead-free window grade durable uPVC, Liniar fencing is designed, modelled, tooled, manufactured, foiled and stocked at Liniar’s state-of-the-art 400,000ft² facility in the heart of the UK. Liniar’s range of uPVC fencing can be installed in exactly the same way as concrete or timber products but offers a more flexible and durable solution. The lightweight properties also make them easy to transport and to carry. Liniar deliver to almost anywhere in the UK with its own fleet of vehicles – and because most components are available from stock, lead times are kept low, meaning fencing can be supplied quickly. Despite its lightweight design, Liniar’s fencing system is sturdy, durable, long lasting and completely waterproof. Posts and gravel boards are around 10% of the weight of concrete and can be lifted easily for a simpler installation. 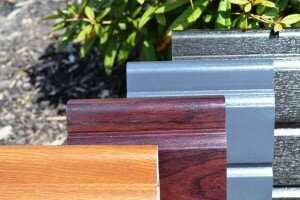 One of the great things about Liniar’s fencing system is that it covers all needs. It can be used to replace existing timber panels, Liniar’s uPVC gravel boards simply slot into concrete posts to create a full panel. Alternatively, timber fence panels easily slot into Liniar’s posts, with a uPVC gravel board at the bottom to protect the wood from condensation damage. Or, for the full effect, have both Liniar posts and gravel boards – maybe mix and match colours for a completely unique finish? There is a whole range of possibilities. Fence panels made up of Liniar gravel boards are also ideal for neighbourly harmony. Friends next door won’t have any painting to do either and there’s no ‘bad side’ to lumber them with – they may even be interested in splitting the cost. Liniar’s fencing system doesn’t rot, chip, corrode or require painting – and because there’s no risk of splinters it’s also more child friendly than timber. 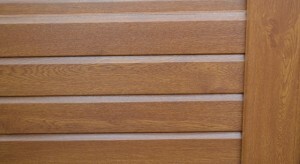 Click here for more information on Liniar’s fencing range.